How to Fix Windows Backup and Restore Error 0x800700b7? Home »	Fix » How to Fix Windows Backup and Restore Error 0x800700b7? Issue: How to Fix Windows Backup and Restore Error 0x800700b7? I’m doing system and file backups regularly using Windows Backup and Restore. I’ve tried to do so yesterday, but received an error and went to the Services to check if the needed services were started. However, I’ve found Block Level Backup Engine Service not started and tried to start it manually, but then the error 0x800700b7 showed up. What else can I do? Please help! It’s a pity you haven’t indicated if you have initiated any system changes recently. That would be helpful for identifying the core of this issue. Nevertheless, 0x800700b7 error is known as a Windows System Restore and Backup Error due to the fact that it shows when trying to preform system backup or restore it. It is not limited to one version of the OS, what means that it may occur on Windows 10, 8 , 8.1 and older versions. We’ve found several speculations that this piece of bug may be related to the anti-virus. However, hundreds of Windows errors are triggered by software conflict with anti-malware, so, in general, it’s advisable to disable anti-malware in case of any system error, including 0x800700b7. Despite this, it may also be caused by registry failure, compromised system files or malware. Even though it’s not clear what issues trigger Error Code 0x800700b7 while trying to backup system files, we wound several fixes that helped people to deal with this problem. 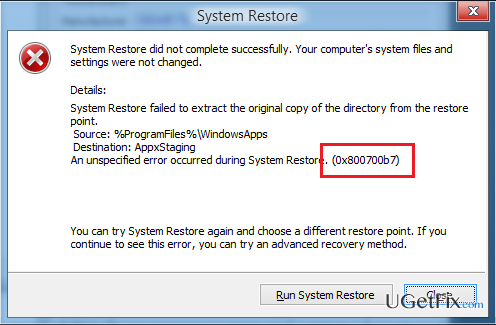 How to fix System Restore Error 0x800700b7 on Windows? Click Win key or Start depending on which Windows OS version you are using. Type regedit in the search bar, and press Enter. If you are asked to enter administrator password, make sure you enter it in the right way and press Continue. Navigate to HKEY_LOCAL_MACHINE\SOFTWARE\Microsoft\Windows NT\CurrentVersion\Schedule\TaskCache location using the left navigation pane. Right-click on this key and select Export. Then select to save the key as a backup. Once you save the backup of this key, delete HKEY_LOCAL_MACHINE\SOFTWARE\Microsoft\Windows NT\CurrentVersion\Schedule\TaskCache\Tree\Microsoft\Windows from the Registry. After that, reboot the system and check if you do not receive 0x800700b7 error message.